Of bones, beads and bracelets. 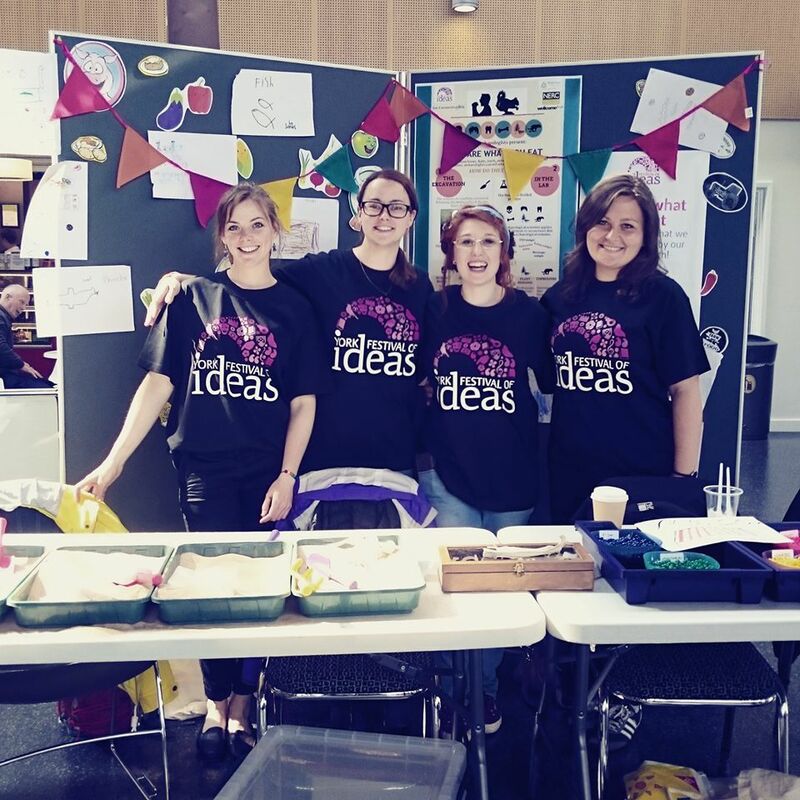 The Festival of Ideas at York. You are what you eat activity at the Festival of Ideas. With me in the picture there are two of my three adventure companions Chloe and Keri. What happen if you put together 5 kilos of sand, several bits of bones, 72 markers, 2 drawing pads and countless coloured beads? The official answer is an amazing interactive activity for children and the unofficial one is happy kids and tired but satisfied archaeologists. The challenge that we were facing while designing the activity was a big one: how to communicate the science behind the reconstruction of diet in the past, to children from 6 to 12 years old and having fun! After some deep thoughts and several cups of coffee we decided to split the stand in three different stations that could be accessed singularly and in random order. The first station was called “The Dig” and it was a recreation of an archaeological excavation. Four trays of sand were prepared with several archaeological finds (plastic or real ones) hidden in it. All the archaeological finds were useful to establish diet including human bones, animal bones, teeth, hair, coprolite and plant remains. Many kids got involved in the excavation and how can we blame them? Playing around with sand while finding archaeological remains is just the best. For future reference though a brush might come in handy since there was almost a beach around the table after the first hour. The second activity was “At the shop“. Four bowls with different beads were prepared for the kids to shop their own food. The blue beads represented fish, the red ones meat, the green ones fruit and vegetables and the yellow ones carbohydrates. We asked the children to pick up their favourite food or what they usually eat and built a bracelet of their diet with the beads. Once they built their own bracelet to take home, we were asking them to guess what we were eating looking at our bracelets. All of them immediately made the connection and discovered that I can’t have carbohydrates, one of my colleagues is a vegetarian and the other two have a very balanced diet. The link between reading the signals on the bracelets and reading the isotopic signals from the bones was rather straight forward and several children as well as parents were very interested in knowing more about how do we do it! The last station was “Draw your favourite food” and aimed to involve the smaller kids that would probably get distracted more easily. The theme of the drawings was rather flexible and we had all sorts of contributions from Mr. Bonehead (in the picture), to the childrens’ favourite animals and also some food with a great prevalence of sausages, toast, chicken nuggets and pasta. The activity was a success and we had very positive feedback from both the children, who would immediately engage with the excavation, and the parents that stayed a bit longer for a chat. The reactions from the parents were mostly of curiosity towards the science behind archaeology. Most of the people ignored how much information can be acquired from the bones and the archaeological finds in general. A lot of work needs to be done in this sense and I believe public engagement activities like this one are fundamental to reach out and get the science out of the lab. 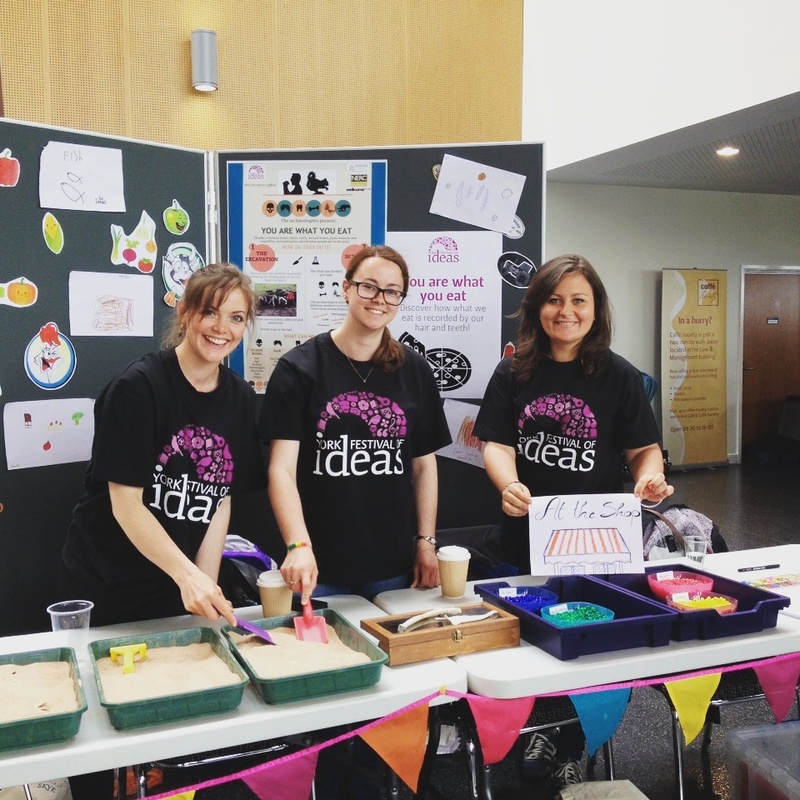 For more information on the Festival of Ideas click here. Last but not least I have to acknowledge my adventure companions for the excellent work and coordination before and on the day of the activity. Special thanks to Keri Rowsell, Rachelle Martyn and Chloe Brown. The entire team from the left Chloe Brown, Keri Rowsell, Rachelle Martyn and myself. June 15, 2015 in Uncategorized. Winter school in Grosseto: an unforgettable teaching experience! ← Historicfoodscapes goes to Sicily!